Most people, at some time in their lives, have marvelled at the beauty and grace of a butterfly darting from flower to flower, or have looked on in fascination at a moth drawn to the flickering light of a candle. 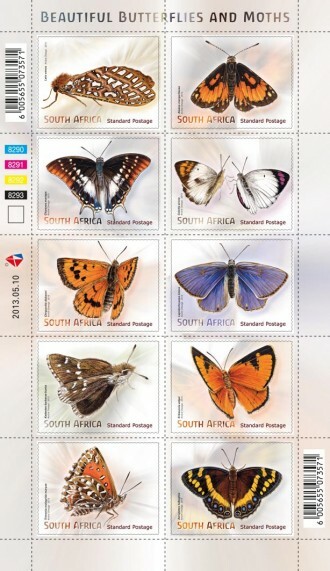 In recognition of South Africa’s rich variety of lepidoptera, the Post Office will issue a set of 10 stamps and two first-day covers featuring moths and butterflies on 10 May. 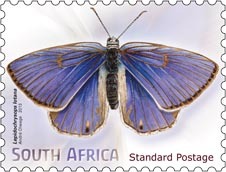 Butterflies have been the subject of numerous poems, paintings, songs, studies and collections. The delicacy of their finely patterned wings, some of which are painted in vivid colours, their energetic behaviour and conspicuous presence in our gardens and nature reserves all contribute to our fascination with them. 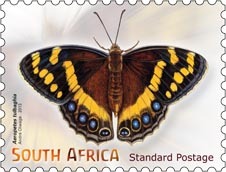 However, “the charm of butterflies is not just their beauty; they lead fascinating lives that are often still not fully understood and, most of all, looking for them is fun,” says Steve Woodhall, President of the Lepidopterists’ Society of Africa and author of books on butterflies such as Field Guide to Butterflies of South Africa, and What’s that Butterfly? (Struik Nature). 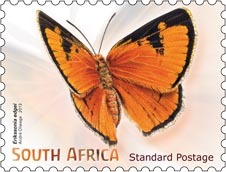 In South Africa, there are about 670 butterfly species, of which 6% (40 species) are listed in the latest Red Data Book (in prep.). Two species have already become extinct, three are listed as critically endangered, six are endangered and 29 are vulnerable. 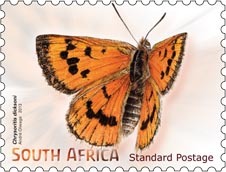 The butterflies and moths depicted on the stamps, were chosen for “conservation status (rare and endangered), endemicity, and beauty”, says Woodhall, who helped to choose the species. Aeropetes tulbaghia (Table Mountain Beauty), for example, “is a near-endemic charismatic species that we’re promoting as our National Butterfly… Alaena margaretacea (Wolkberg Zulu) and Lepidochrysops lotana (Lotana Blue) have recently had second localities discovered, they were once only known from single localities…” says Woodhall. 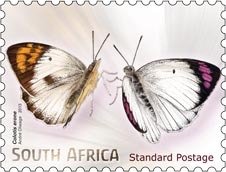 ● Alaena margaritacea, the Wolkberg Zulu belongs to the Lycaenidae family. It is endemic to South Africa, where it is only known from grassy slopes adjoining afromontane forest in the Haenertsburg area near the Wolkberg in Limpopo. It is under severe threat from alien tree plantations, as only two colonies are known to exist. ● Erikssonia edgei, Waterberg Copper is a butterfly of the Lycaenidae family. It is found in South Africa from the north-facing base of the Perdekop peak in the Waterberg. It is named after Dave Edge, who, together with Esmé Edge, discovered the population in the Waterberg near Vaalwater. 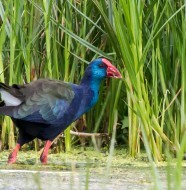 It has since disappeared from this locality and may now be extinct. ● Lepidochrysops lotana or Lotana Blue is a species of butterfly in the Lycaenidae family. It is endemic to South Africa, where it is only known from two localities in the Limpopo province – on the western slope of the Ysterberg and from Lekgalameetse Nature Reserve to Serala Forest in the Wolkberg area. ● Chrysoritis dicksoni, Dickson’s Copper or Dickson’s Strandveld Copper is a species of butterfly in the Lycaenidae family. It is endemic to South Africa, where it is only known from near Witsand in the Western Cape. Previously, it was also found north of Cape Town. It is sometimes separated in the monotypic genus Oxychaeta. 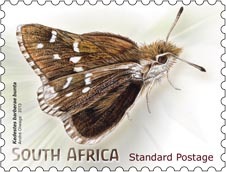 ● Kedestes barberae bunta or Barber’s Cape Flats Ranger is a butterfly of the Hesperiidae family. 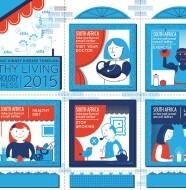 It is only known from one small locality at Strandfontein, near Cape Town. ● Trimenia malagrida malagrida or the Scarce Mountain Copper is a butterfly of the Lycaenidae family. It was once found near Lion’s Head in Cape Town, and is feared to be extinct. 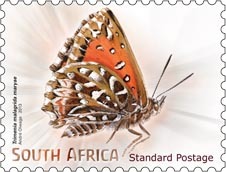 ● Charaxes marieps, or Marieps Emperor is restricted to afromontane forest in Mpumalanga, south of the Olifants River (centred on Mariepskop) to Sabie. ● Colotis erone, or the Coast Purple Tip is found in coastal lowland forests and wooded savannah from Port St Johns in the Eastern Cape along the coast to Durban in KwaZulu-Natal and as far as Mozambique. ● Callioratis millar or Millar’s Tiger Moth is one of a few species of geometrid moths, probably of ancient origin, that could be regarded as living fossils called the diptychines. There are 17 known species belonging to the subfamily Diptychinae, all confined to Africa. 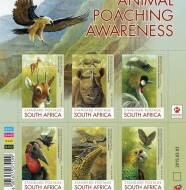 There are seven species of Callioratis, five endemic to South Africa. ● Papilio euphranor, Forest Swallowtail or Bush Kite is a scarce, endemic butterfly of the Papilionidae family found in southern Africa. 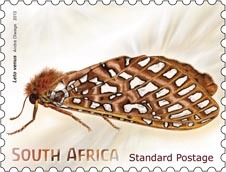 André Olwage, who created the artwork for the stamps, has been illustrating insects since 1984 for various publications and institutions. 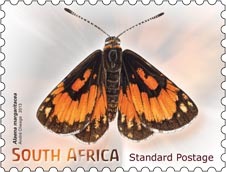 Working from photos supplied by Hermann Staude, a butterfly and moth fundi, he used “watercolour and a touch of pencil crayon in some areas,” says Olwage. 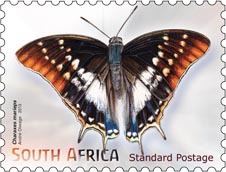 These stamps are sure to be in big demand among the thematic collectors as the artwork on these stamps is just as beautiful as the butterflies themselves. Go get yours quick before they sell out.